Growing from seed to table and the life in between. 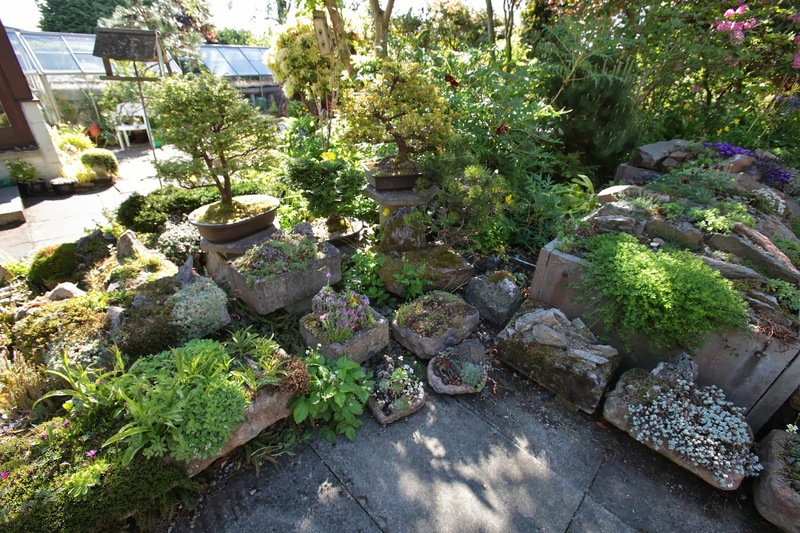 Next up on the "Scottish Trip" was my primary destination- the garden I had visited so many times in cyberspace in Ian Young's Bulb Log Both Ian and his talented wife Maggi have been at the heart of the Scottish Rock Garden Society's ether presence for many years. Well, that said, they also were present at other pre-Facebook activities like writing for journals, garnering lots of medals at shows, judging, lecturing, etc. The popular bulb log was started in 2003. 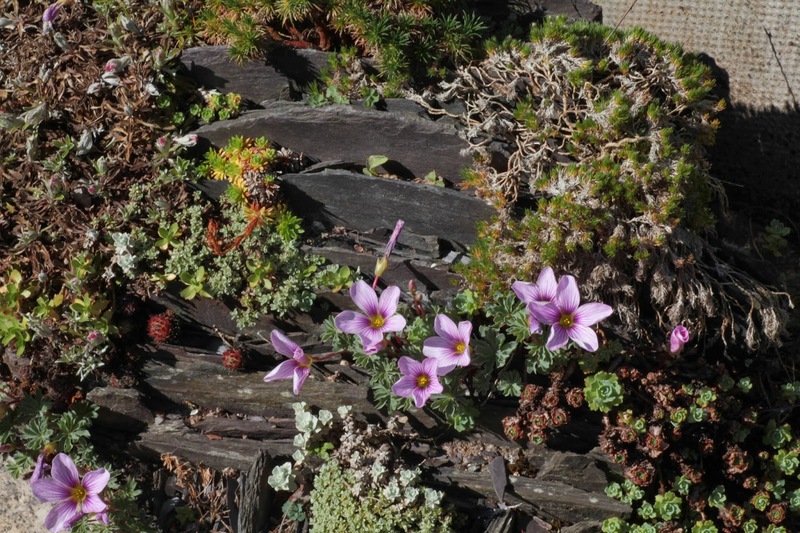 Meanwhile both Maggie and Ian are "hero" members of the famous SRGC Forum Maggi is also co-editor for the International Rock Gardener and provides quite a bit of drive. 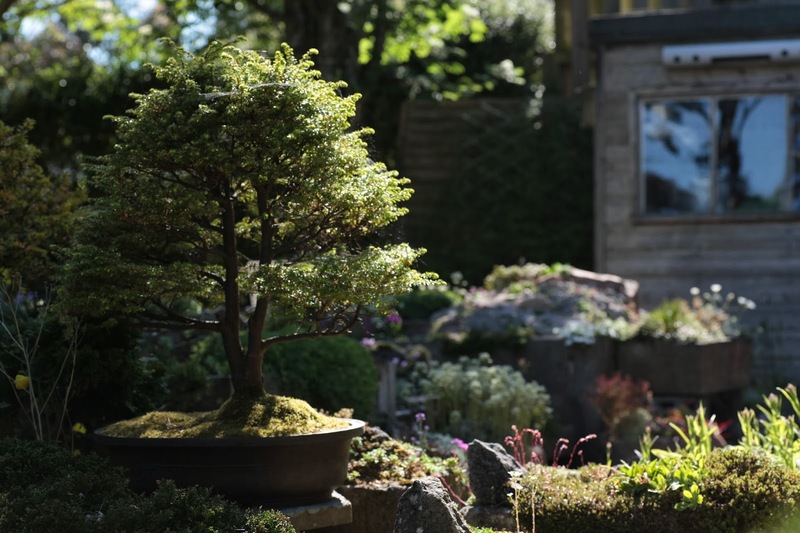 To see this wonderful garden and visit with these amazing plants-people in person was a dream come true. Imagine my delight as I peeked out the window in the early morning light. What a view. I chortled with delight. Since it was early June, days were long, but I felt no jet lag after the infusion of this scene. I raced downstairs. My hosts were most hospitable and had laid out a breakfast feast. But I gave into an unmistakable urge to bolt outside and take a breath before I sat down. 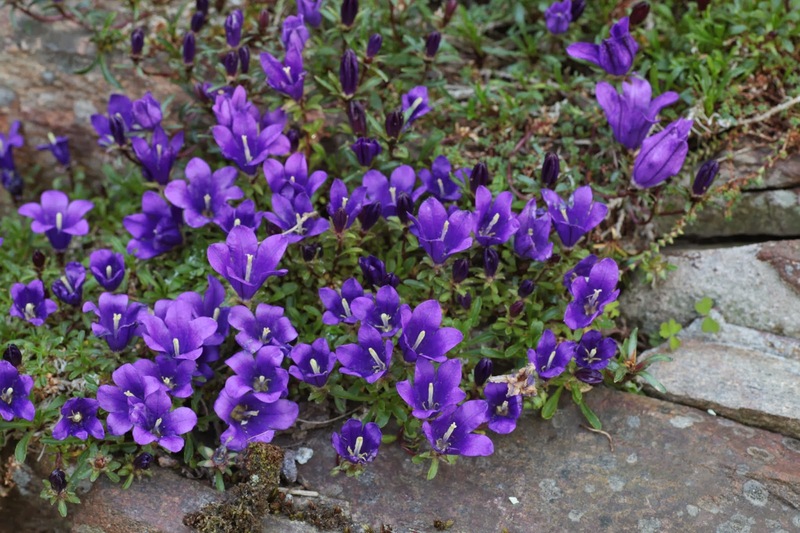 How sweet the air perfumed by Scotland and the alpines! 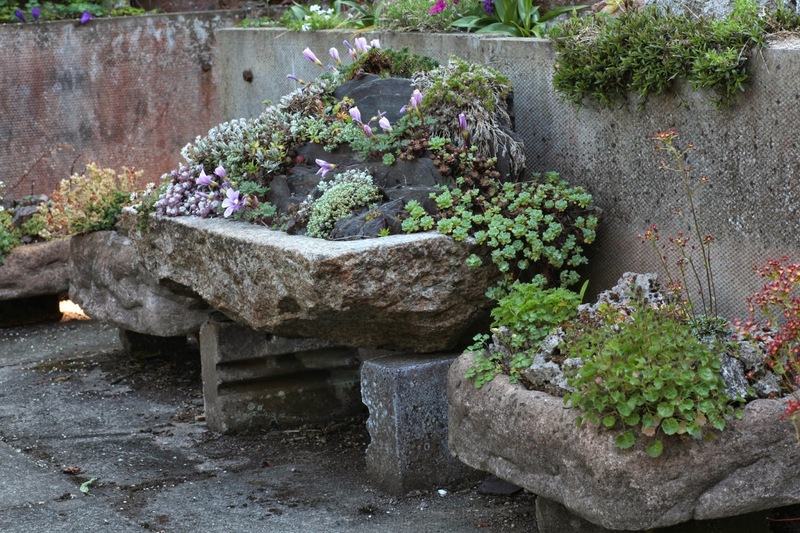 You may have guessed by now I am fascinated with the shape and form of troughs. Not only are they sculpted with a static state, but also add an element of performance during the year. So many new ideas to try - not only color but flow and texture. 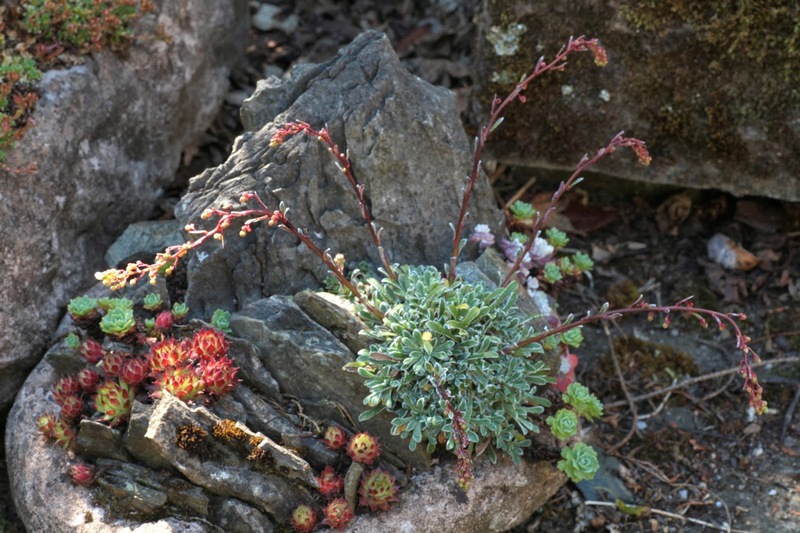 I love the compliment of the rock color choice echoing in the sedums, especially the Sedum pilosum, always a favorite. Is it the blue that is so attractive? 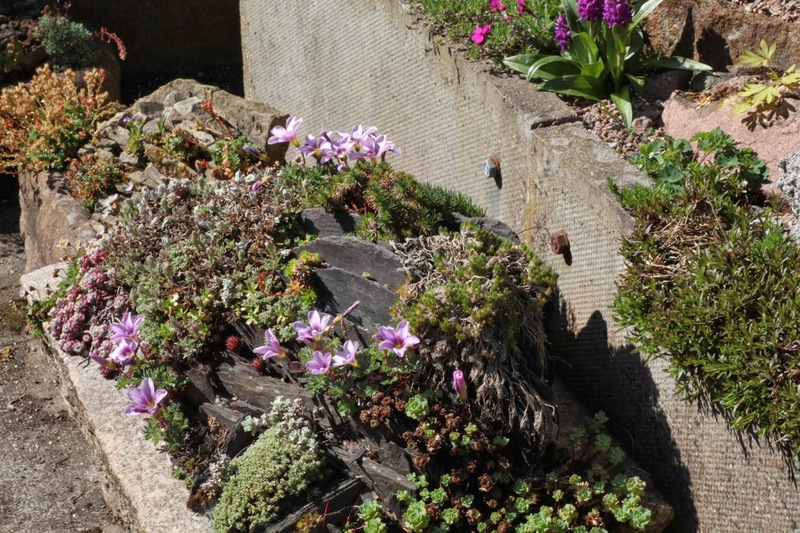 Edraianthus have been given a large trough filled with crevices to romp and roam. And what a good one is this. Usually mine will place themselves here and there, but never together for such a display. 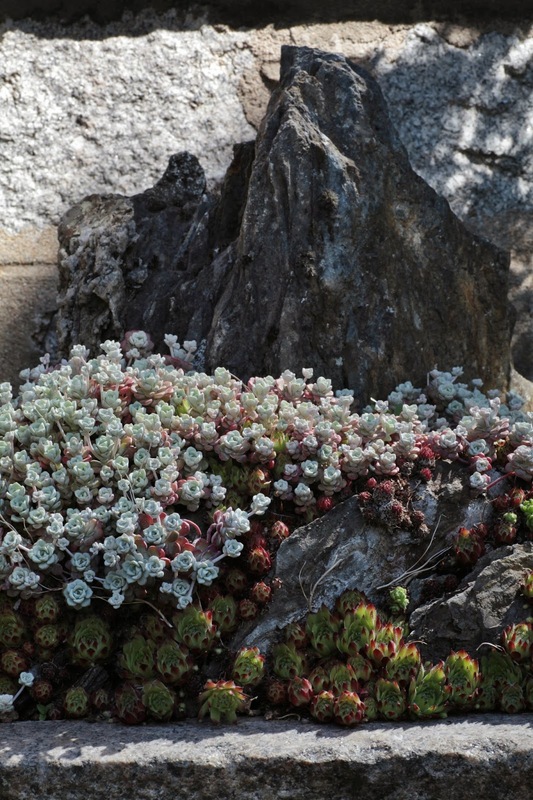 I did not determine if this was just one plant or many. The Youngs have lived in this house for many years, and have obviously enjoyed trying out many presentation ideas. 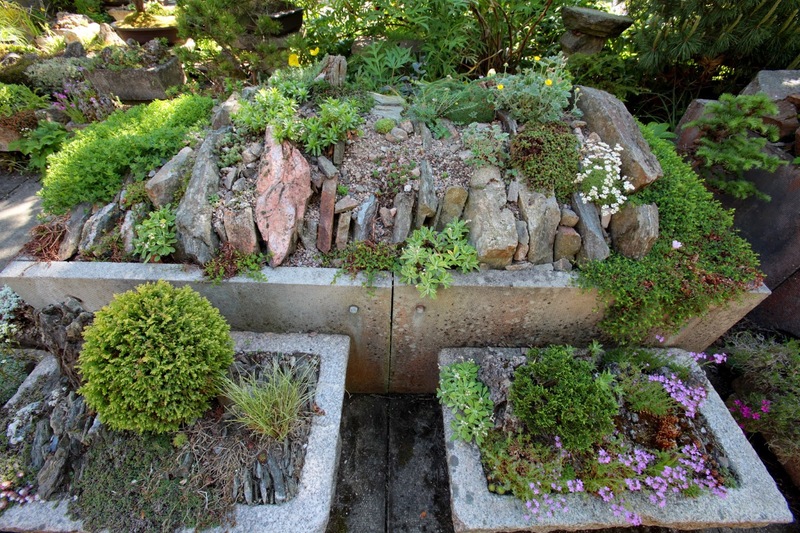 The circle of troughs creates a relaxing focus and entrance to the garden. Probably too it makes for easy weeding. 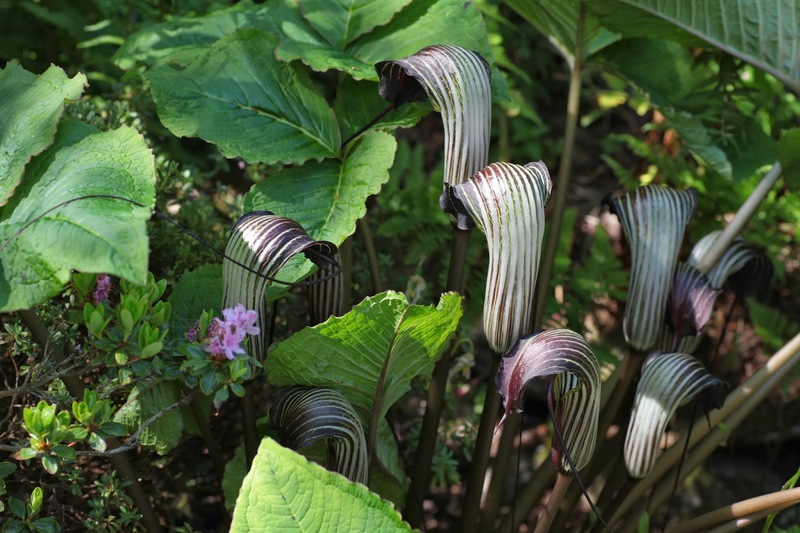 And with this kind of immediate scrutiny as you enter, each trough must hold its own, if in bloom or not. The do get cold weather in Scotland, which must magically transform the view yet again. 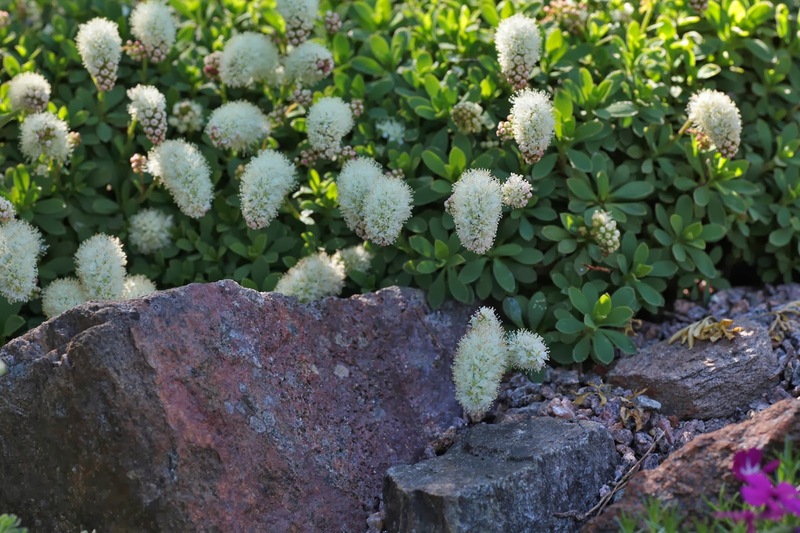 Seems like the rock crevices and miniature evergreens would create a good variety of form under snow. 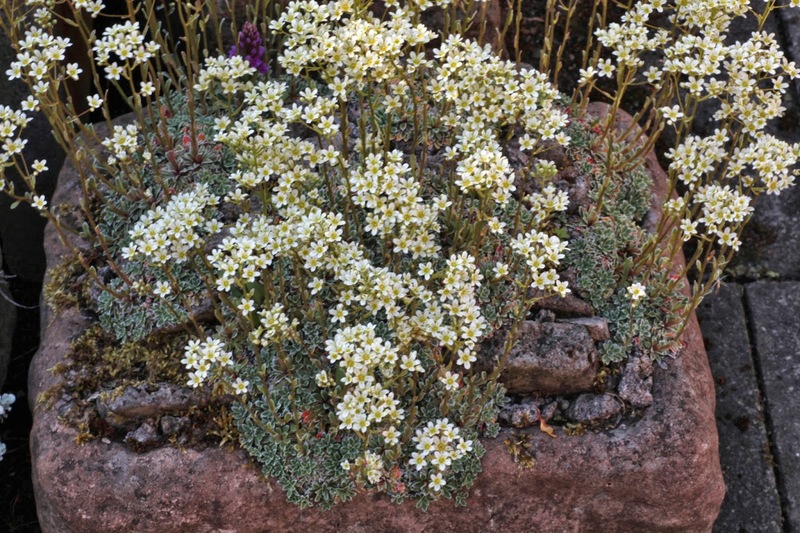 Silver Saxifrage - S paniculata minor? I especially liked the contrast of the various materials, such as of the red stone and green sax which picked up the red in buds. And there is something to be said of single culture troughs. Wow. Feet for the troughs also added to the dimension. While I have always just sunk my troughs in the sand, I like this added staging. 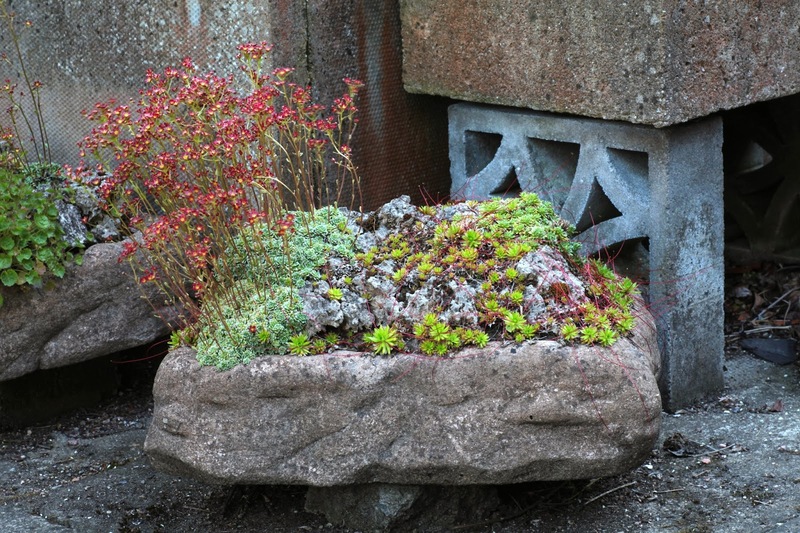 They used a variety of materials, but all with the look of stone, which provided a look of uniformity. Very nice. No, this is not a sax and a semp - look again. 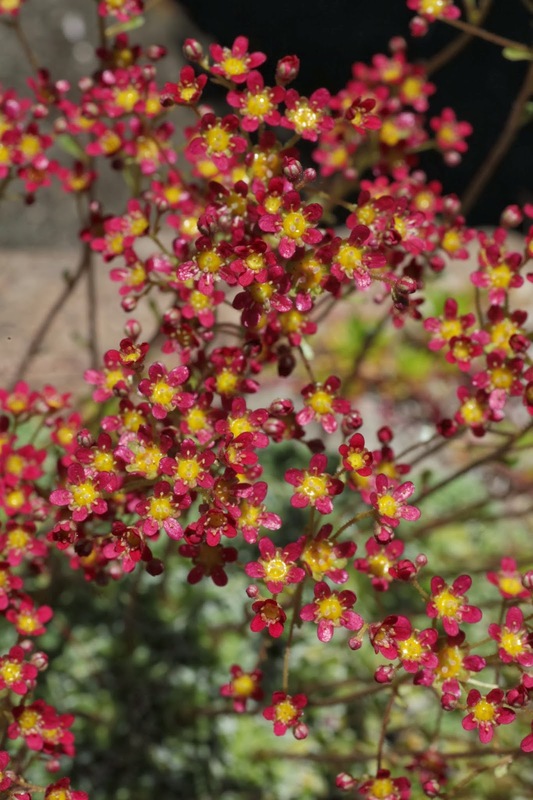 Those strawberry runers are yet another saxifraga- who can resist S brunonis? Flowers will be much later in the season, an added pleasure. 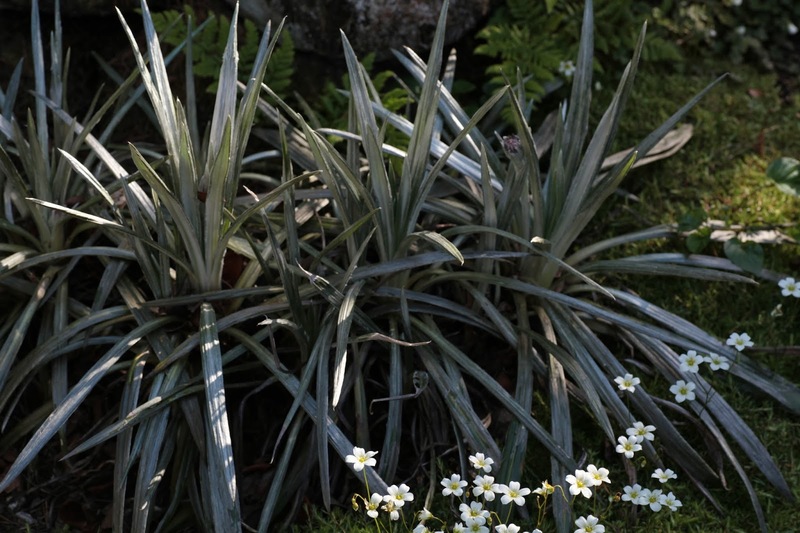 I have resisted this species before because of questionable hardiness. But I must must try it, even if it means moving a trough closer to the house in fall. S. 'Foster's Red' is quite hardy and a favorite, always of vision of Linc. 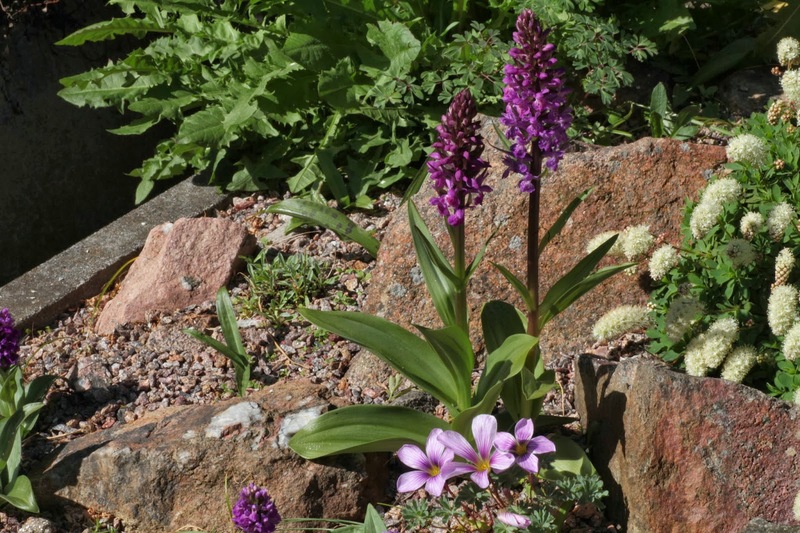 The selected plant material throughout the garden was all very well considered and choice. Color elements were reflected as I ever so slowly made my way down the main path. Clearly the Young's love the plants. side by side with the Australian celmisia. In fact they all got along famously. 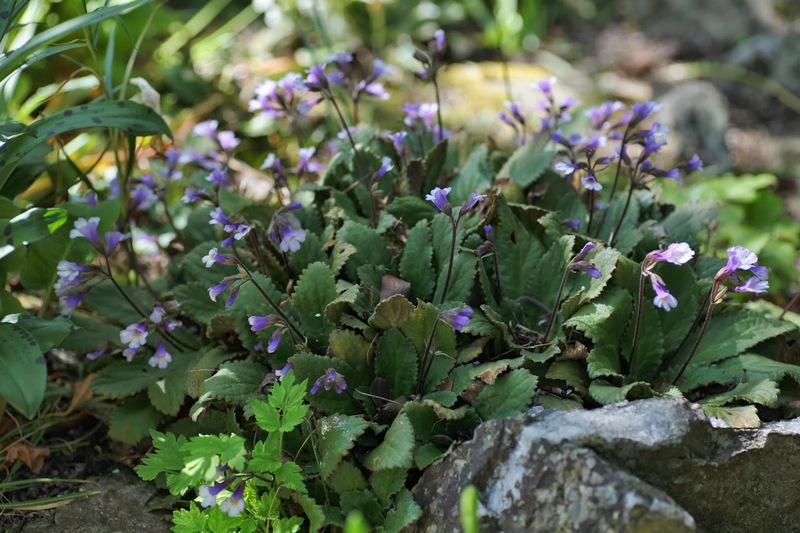 A plant I always relish seeing is that African violet relative, Haberlea rhodopensis. 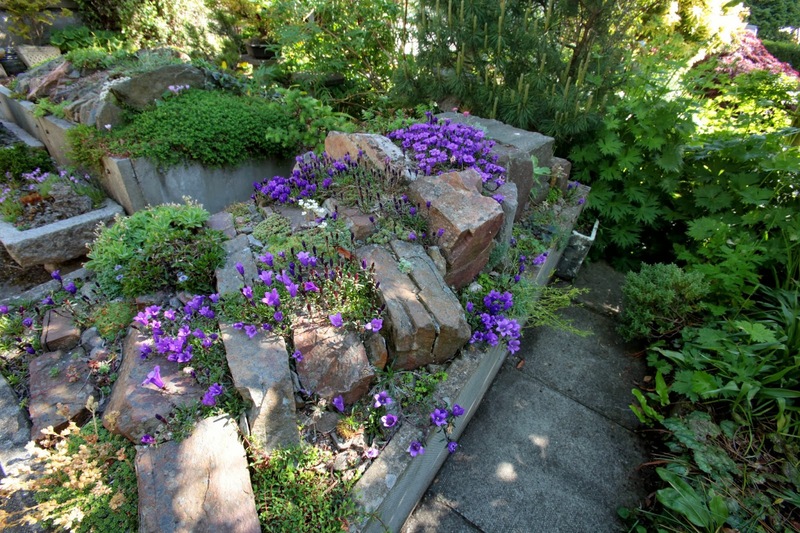 Here is a very lush planting of it, in the semi-shaded area of a large trough. They often get quite large with age and care. 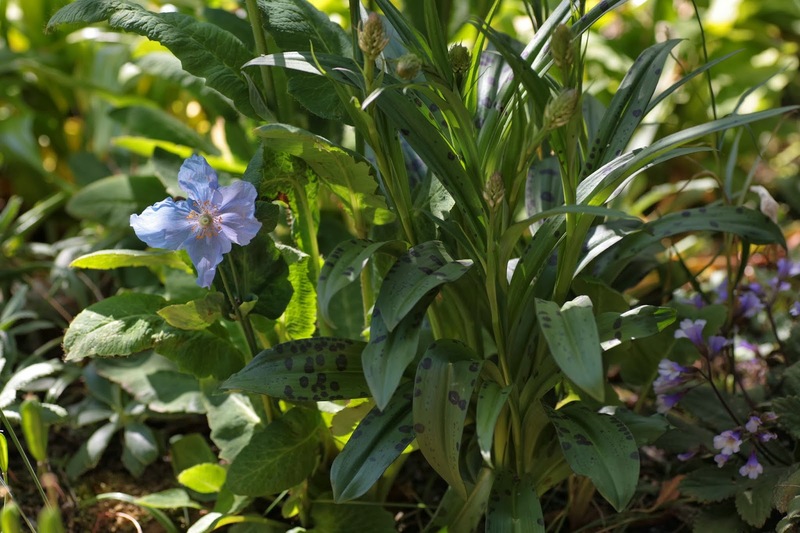 One surprise was this little meconopsis which had nestled itself nearby under the spreading arms of another dactylorhiza. Was it serendipitous? I don't believe they are usually this diminutive, so maybe we are witnessing a phenomenon. If it grew much larger I am sure it would be quickly shown the way off stage. 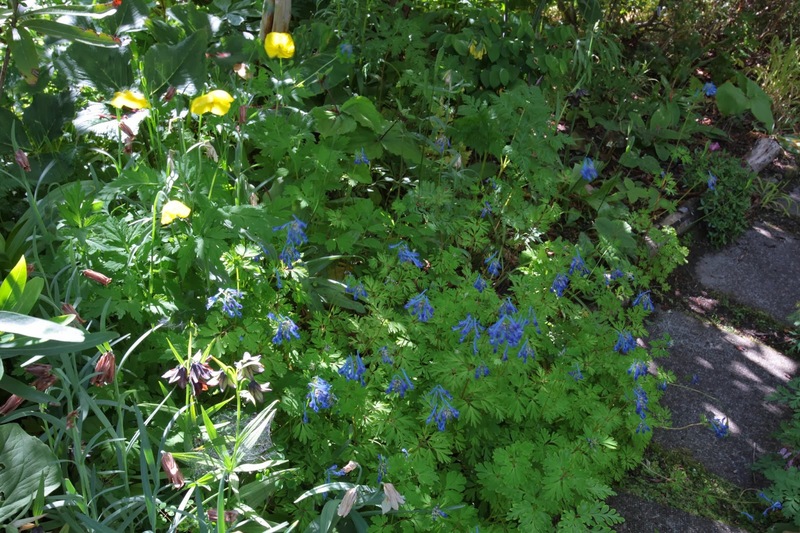 But then again this is the garden of connoisseurs - maybe there is a very diminutive meconopsis? 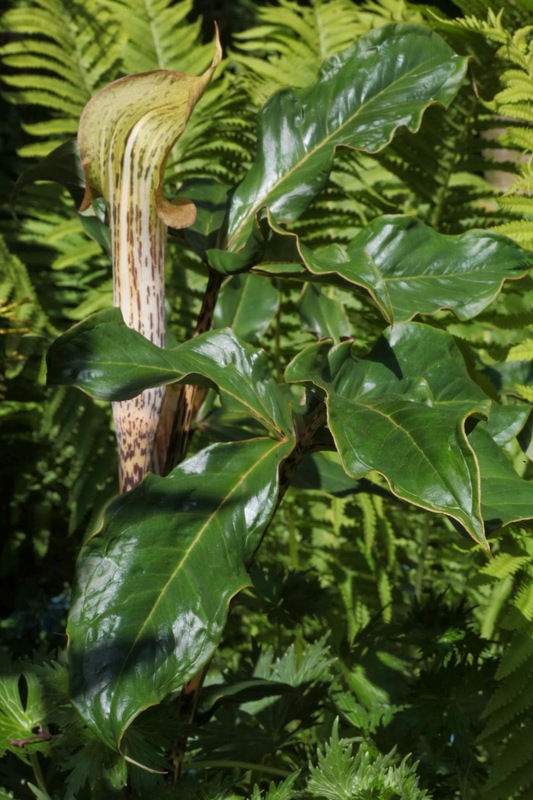 After tearing myself away from the troughs and the hundreds of different species, I started down the proverbial garden path towards the fabulous Rhododenron 'Albert Schweitzer'. 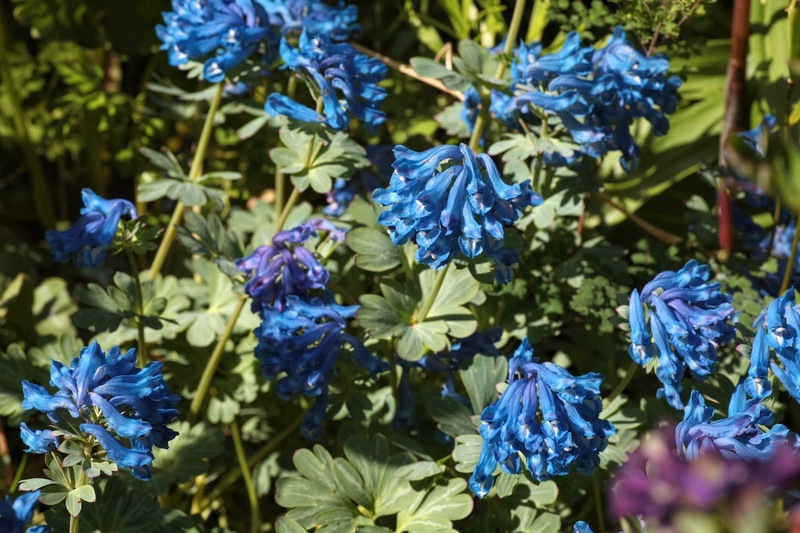 Immediately I noticed one of Ian's signature plants of Corydalis behind a very nice showing of , is it Fritillaria camschatcensis and Meconopsis cambrica. 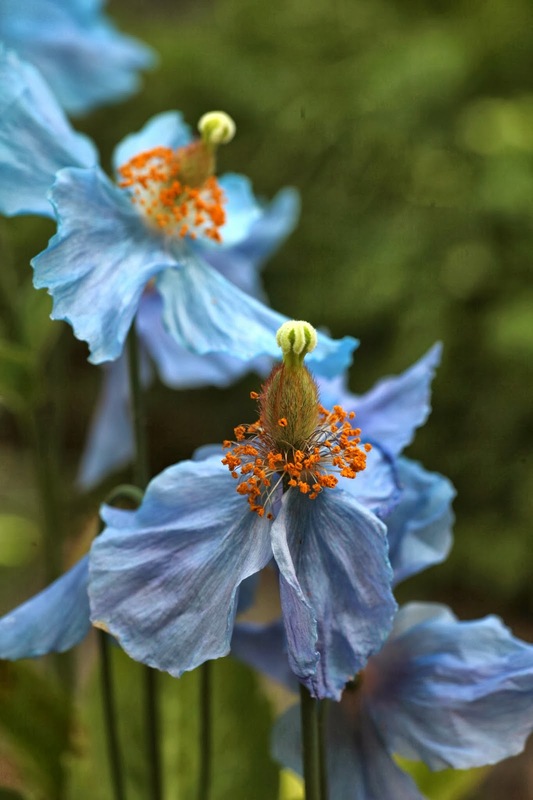 Oh yes, and would it be Scotland without Meconopsis? At the back of the garden was a small pool. 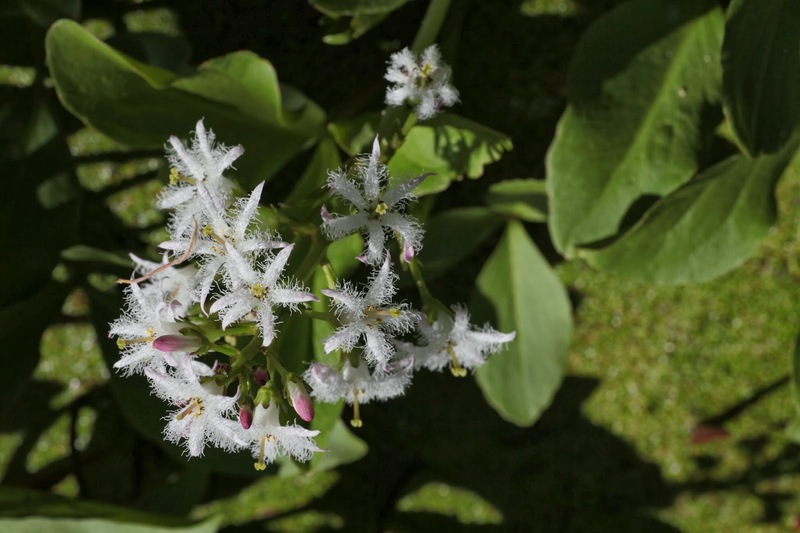 Menyanthes trifoliata was blooming throughout. Notice the exquisite sticky flowers. Wonderful! 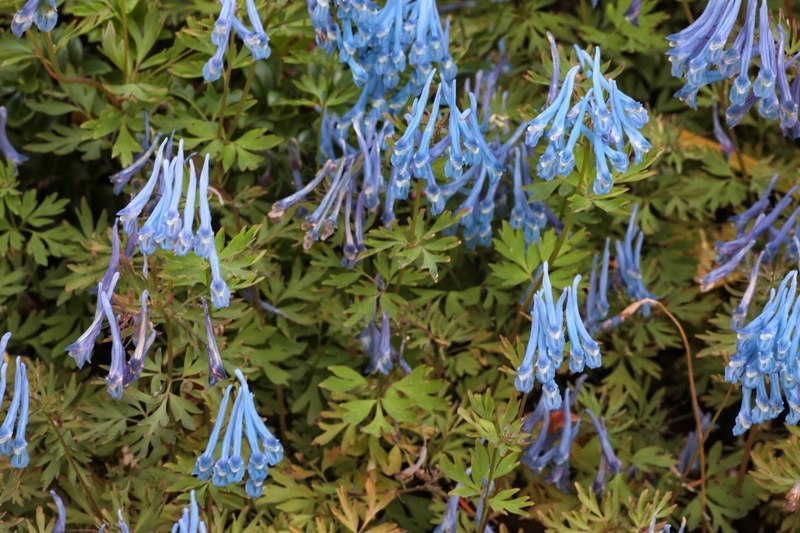 Everywhere I turned more corydalis winked hello. Oh, and then up popped the Arisaemas. Whew! Look at the gloss on those leaves. My guess is rust never darkens their air. The climate may be moist, but none of that fungus of home. Look at that lash...um, spike! Maggi opens up this choice little guy so I can see the extent of the tail...or is it tongue? 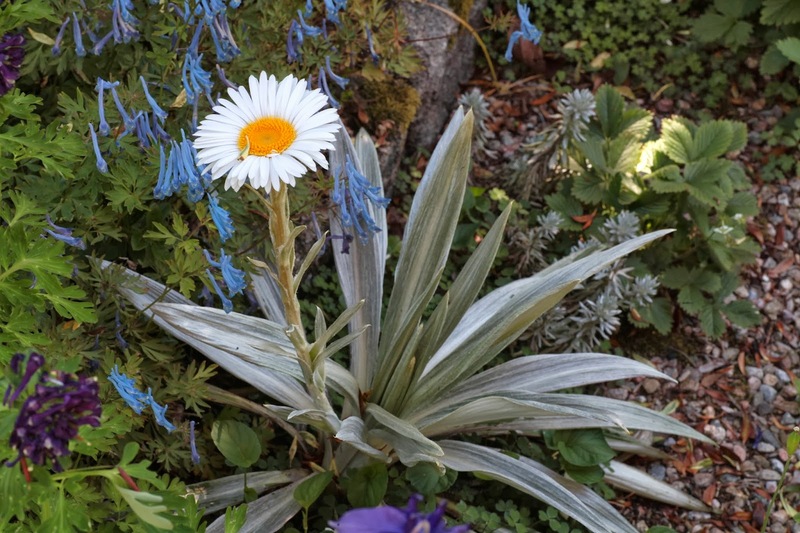 Everyone loves a daisy. Here they go for the celmisia with a double punch. 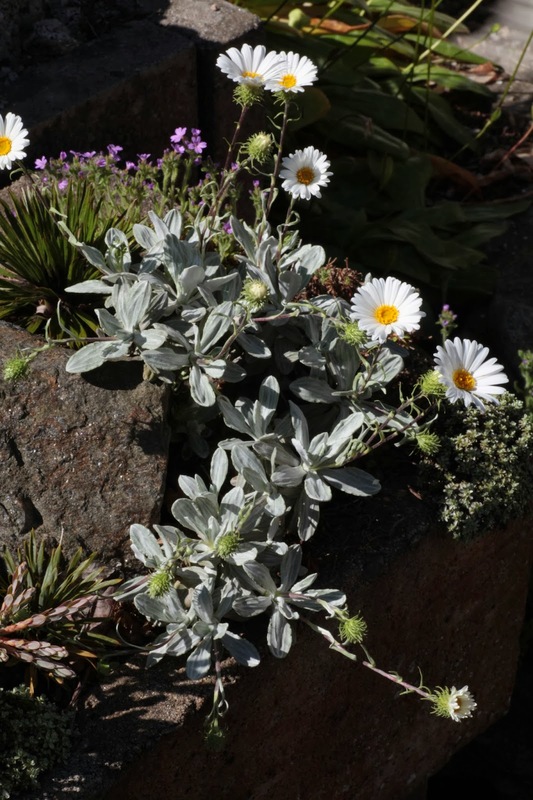 You get the charming daisy with a stunning silver foliage. 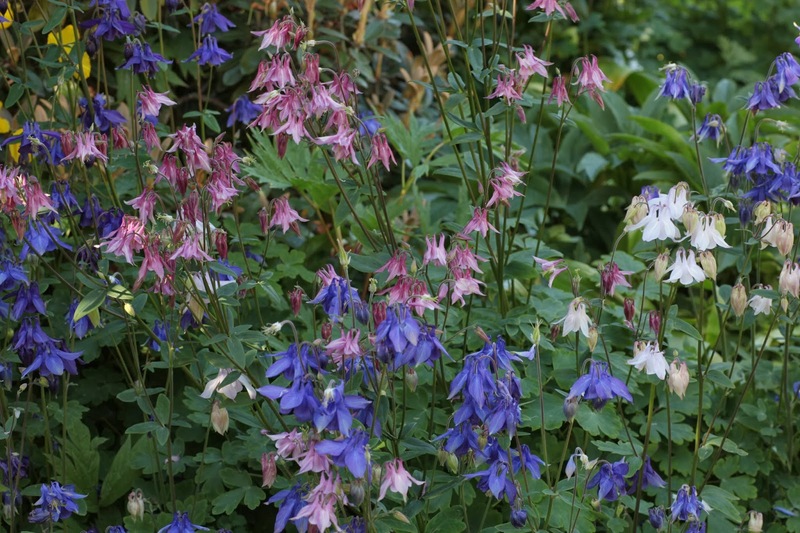 And Maggi also pointed out one of her particular favorites - the mingling pastel clouds of aquilegia, never an uncommon sight. 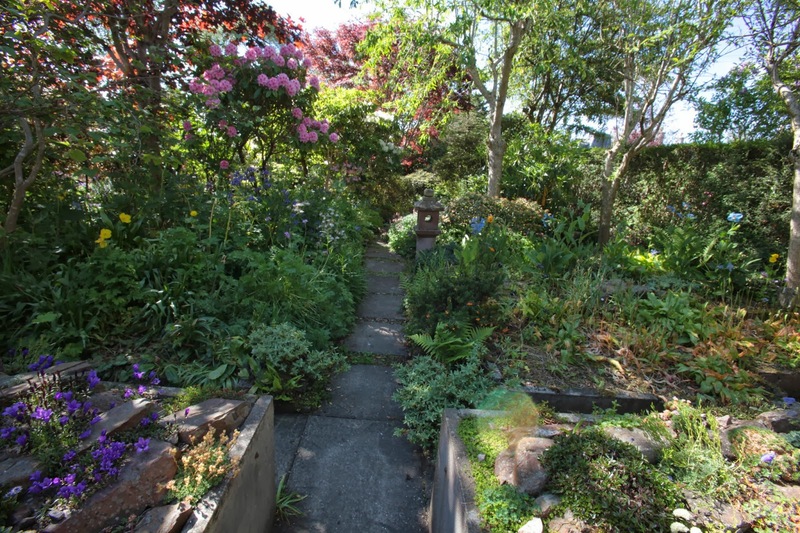 This brings us round about back to the garden entrance. What a memory this day will remain. This is only a slight representation of the garden and fun at the Young's. I encourage you to follow the bulb log, in pdf format, so you can still print on paper. 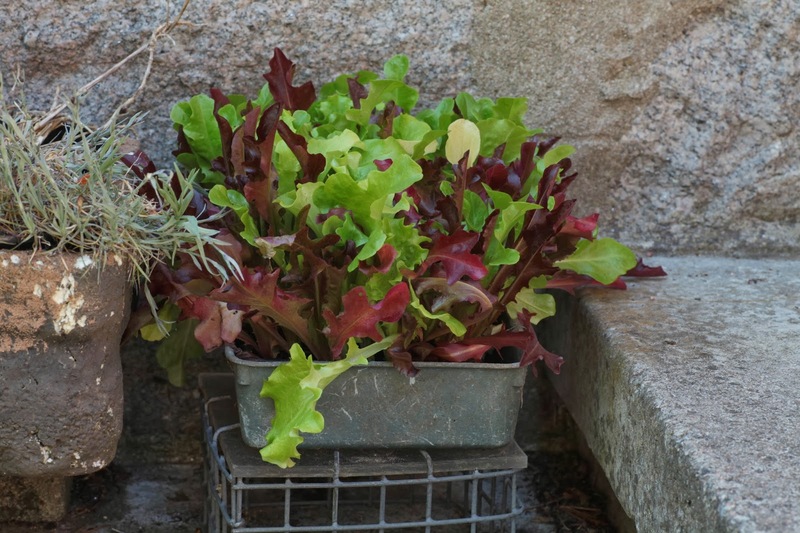 Oh yes - and they have a great way to grow lettuce by the back door! Thank you so much for posting this! What an amazing collection. I'll be revisiting this post for a long time. I'm curious about the large troughs that seem to be held together by bolts. What is the story with those and their construction? Are the stone/concrete panels bolted together, like they appear? I'm so jealous! What wonderful pictures of the Youngs' masterpiece! I must dream up a way of getting there soon...Thanks for posting these. 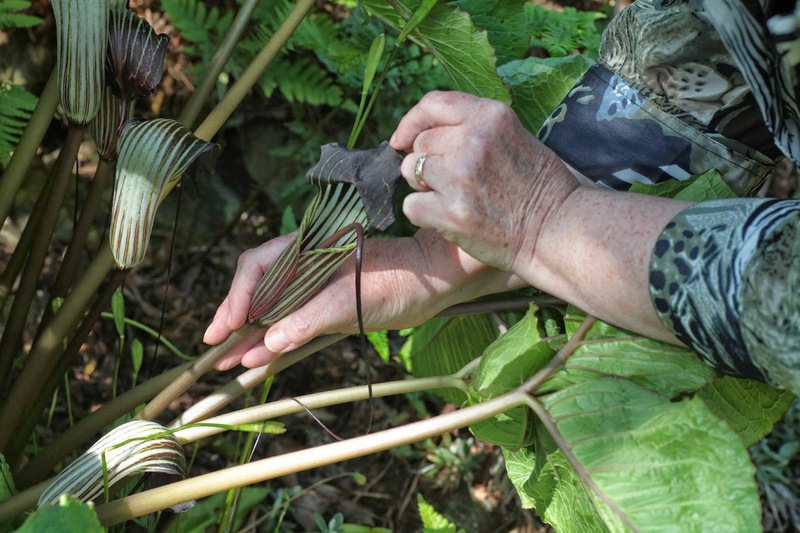 -gardening (with special emphasis on growing from seed) and cooking in the Litchfield Hills of Connecticut (no reliable snow cover with zone 5/4 temperatures).